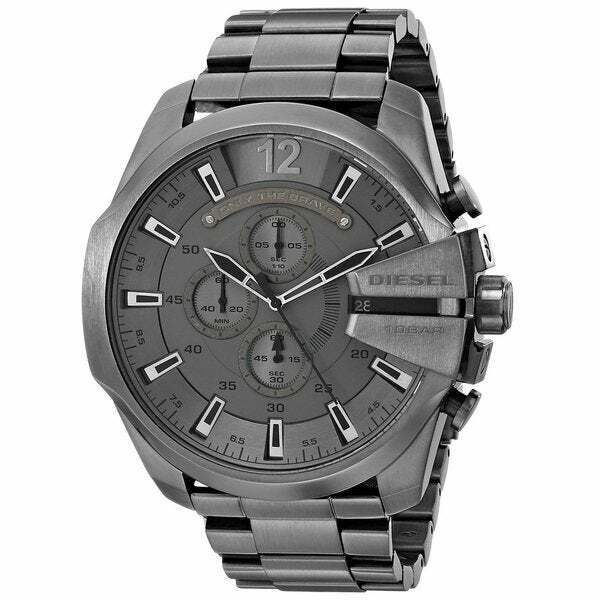 A grey stainless steel case on a matching bracelet defines the rugged and handsome style of this Diesel timepiece for men. This watch has a grey dial with matching hands and stick hour markers complete with three subdials. I purchased this watch as a gift for my boyfriend and he absolutely loves it. He is a fan of big watches, and this watch is definitely rather large. So if you are looking for a large faced men's watch, look no further. It is very nice and goes well with a variety of outfits. It has held up well and he wears it most days, so I would definitely purchase again. Great looking and quality watch!!! So awesome!! Great looking and quality watch!!! Birthday gift for my Grandson. Love this watch. It's large but Ver solid and stylish. Great price for such a nice watch. The face on this watch is huge and bulky. I would have loved it if it were smaller. Birthday present for my son who turned 21 he's in sales and it looks great on him. "can I purchase extra links for the strap, model DZ4421"